For over 50 years, the Washington, D.C.-based artist William Christenberry has focused his attention on the American South, specifically the landscape of rural Hale County, Ala., near to where he was born. He is best known as a photographer, and an impulse to isolate and examine propels his project as a whole. Christenberry’s recent presentation at Hemphill Fine Arts assembled almost 30 small photographs, sculptures, drawings and prints dating from 1964 to 2014. In the photograph Green Warehouse, Newbern, Alabama (1978), a gently warped green barn appears as a dignified subject. The structure was echoed nearby in Green Form (2001), a dense, diminutive painting in beeswax and encaustic on wood. The work’s thick surface almost palpably vibrates with pathos and care (one might think of certain abstractions by Forrest Bess). Five drawings made between 2005 and 2010 depict the suggestively gnarled trunks of trees in ink on paper. A 1989 mixed-medium sculpture, Southern Monument XXII, represents a beguiling example of vernacular architecture, here rendered as a dollhouse-size study in texture, tone and scale installed upon rich red dirt. The most recent work on view reflects Christenberry’s longstanding interest in found signage, which he has collected over the years and hung in his studio. Titled Studio Wall, this graceful silkscreen repurposes the residue of a vanishing American taxonomy. William Faulkner is a touchstone for many who write about Christenberry; much as the author wrested a lifetime of material from his fictional Yoknapatawpha County, Christenberry’s loyalty to Hale County begets an expansive artistic universe. Human figures rarely appear in his work, but the steadfast devotion with which he has portrayed architecture and nature—and, more significantly, reciprocity between the two—imbues them with an almost human quality. Certain buildings and objects have become totems, visual motifs that the artist has returned to again and again. At Hemphill, various of these motifs, including the green barn and a palmist’s window sign that was depicted in a photograph (1980) and a lithograph (ca. 1990), showed that this pursuit of particular subjects has sometimes spanned decades. While such works stand as impressive artistic statements in themselves, they cumulatively have an even greater effect. As the years pass, as a given subject deteriorates further, each image swells to both acknowledge its predecessors and anticipate its heirs. 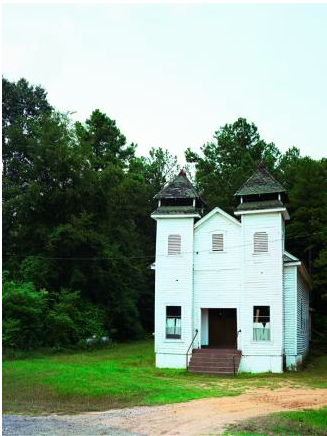 The same holds true for Christenberry’s body of work in general, which offers a forthright and melancholic meditation on time and an elegiac portrait of a place.